There was something special on the menu at a New York soup kitchen Thursday. Those eating lunch at the Broadway Community Inc. facility in Manhattan got a taste of the luxury life, thanks to a gift of caviar from an anonymous donor. 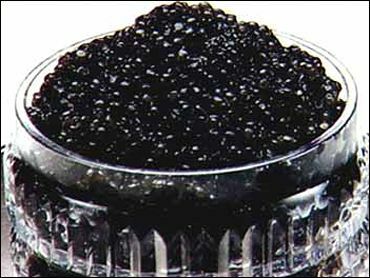 The caviar was served along with sour cream and egg whites and yolks and chives on cornmeal blinis. About 150 people showed up for lunch. Chef Michael Ennes of Broadway Community Inc., told CBS News correspondent Kelly Wallace when he heard of the caviar donation, he thought, "'Yeah, right.'" However, when Ennes realized the donation was for real, he had to ensure everyone got a taste of the delicacy. Ennes said, "I didn't mention the fact they were a fish eggs." Diana Conyers, who received a meal at the soup kitchen, said, "I thought it would taste 'yuck' because I never had caviar. It was surprising, it tasted pretty good." Michelle Seliem and her 8-year-old daughter -- who have been living in a domestic violence shelter for five years -- loved it. Though the $1,100 value of the caviar could have covered more meals for the needy, it was the experience that was priceless. Hosna Seliem told Wallace, "I felt like a princess." After a crippling recession sparked in part by corporate greed, the donor showered the finest things in life on those who have so little, Wallace remarked. George Evans, a diner at the facility, said, "Whoever donated this, maybe they woke up one morning and said 'I have a little more, let me give.'" If you'd like to help this facility, go to Broadway Community Inc.